I’m just getting home from sharing at a conference on nonviolent atonement theories in which I was invited to participate in southern California this past weekend. For those of you to whom the term “nonviolent atonement” is new, this is a family of theories concerning Jesus’ life, death and resurrection that look to Jesus’s life and teachings or his resurrection for salvation, redemption or atonement value rather than the violence of Jesus’ execution on the cross. Giving the violence of the cross an aura of the sacred has been shown to be deeply damaging to communities on the edges or undersides of our society. And yet this aura of the sacred surrounding Jesus’ cross still stands at the center of much of the Western Christian teachings that find their source in European and American patriarchal and colonial theologies. Therefore, nonviolent atonement theories are those theories and theologies that have grown out of oppressed communities that seek to understand Jesus’ salvific role through a focus on the entire narrative of the Jesus story, the story of his birth, life, death and resurrection rather than solely isolating one’s focus on only Jesus’s cross. I shared four different but related nonviolent views of Jesus’s atoning work from four marginalized communities. My first presentation focused on the work of James H. Cone, considered to be the father of Black Liberation Theology, in his revolutionary volume The Cross and the Lynching Tree. In this presentation we considered how Jesus’ death was not something that satisfied Divine justice, but a gross miscarriage of justice by the then status quo through the lens of the lynching history in America. In my second presentation we considered what Feminist liberation theologians as Joanne Carlson Brown and Rebecca Parker refer to as The Myth of Redemptive Suffering. We contemplated how viewing the sufferings of Jesus on the cross as redemptive have proven to be deeply problematic for women who are victims/survivors of violence and injustice. In my third presentation we considered the critique by womanist scholars as Delores Williams and Jacqueline Grant of presenting Jesus as substitute given the way substitution relates problematically with the experience of women of color with surrogacy. Lastly, I shared what I consider to be the perspective of the original, proletariate, liberation communities of early Jewish Jesus followers who in the synoptic gospels and the book of Acts focus on Jesus’s teachings as salvific and his resurrection as being good news as contrasted with contemporary evangelical ways of presenting the gospel today which focuses primarily on Jesus’ death. It’s my belief that one’s social location makes a difference when we consider the meaning and implications of the Jesus story. I also find it fascinating that, given the social location of early Jesus followers, their gospel bypasses and ultimately agrees with much of the emphasis and critique of contemporary oppressed communities as we seek together to reclaim the liberation themes of the Jesus story in response to European and American theologies which have historically used this story to oppress. This material has been revolutionary for me and I’m so grateful for the opportunity to have been able to share it this past weekend. I’m also deeply excited to be able to share it with you, too, on our website. 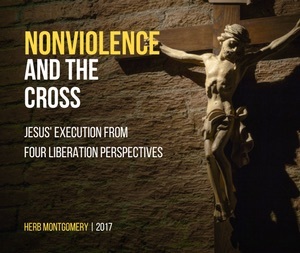 You can find this new series Nonviolence and the Cross; Jesus’s Execution from Four Liberation Perspectives here. Presentation Two: What If Jesus Had Been A Woman? And for those of you who are supporting our work, I just can’t thank you enough. This past weekend proved once again just how vital and much needed our work here at RHM is. We could not exist without you, and I thank you for your financial partnership with us. For those others of you who are interested in supporting our work as well, you can do so by going to renewedheartministries.com and clicking donate. There you can become one of our monthly contributors or make a one time donation. Either way, every amount helps. Together we are making a difference, carrying on the work found in Luke 4.18-19 one engagement at a time.